After dozens of requests from diehard tri-fold wallet fans, we've finally introduced plastic wallet inserts for tri-fold wallets. This tri-fold insert is designed for vertical wallets, but can also be used in the World Wallet or any women's long wallet or passport case. For those that prefer card cases, this style of insert is the most commonly recommended. Best of all, the lightweight plastic inserts are priced low so you won't break the bank (or your back) by adding a set of inserts to your favorite wallet. These inserts are a great inexpensive buy; they make fantastic stocking stuffers! 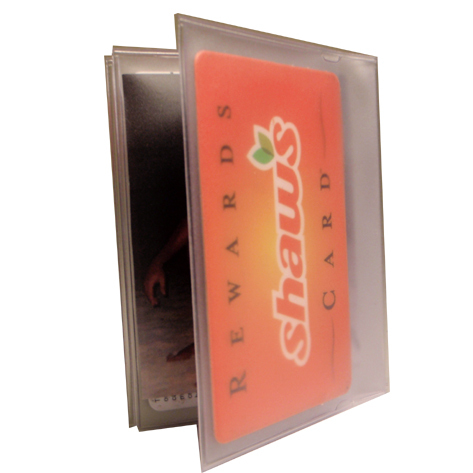 The tri-fold wallet insert has 4 pages of clear plastic sleeves. Each sleeve can hold up to 2 photos or plastic cards (front to back) for a total capacity of 8 photos or cards. Our wallet inserts are made from durable plastic that will happily last through the wear and tear of daily use. Flip through the sleeves with ease to find the photo or card you're looking for. The translucent pockets are easy to see through, giving a full view of the contents inside, so no need to waste time pulling out cards to find the one you need. This insert fits easily into trifold wallets off all varieties, including larger purses and clutches, both zippered and those with a snap closure. Even filled to maximum capacity, these inserts have a smart, slim design that offsets their addition to your wallet. They're perfectly sized in every way to fit inside wallets without poking out of the seams. You won't have to deal with unsightly plastic corners or edges that disrupt the compact profile of your Big Skinny wallet. Tri-fold wallet inserts are great for showing off pictures of your kids, your friends or your pet goldfish. They can also hold credit cards without stretching or breaking. The plastic wallet inserts have a slim profile and offer tons of storage space without adding bulk to your wallet. Order a few for yourself and your family and friends-trust us, they'll thank you for it! Best of the best , This is one your personal effect to keep it with you at all time to keep all your stuff . Dont cares for brand name wallet in low quality. I tried using the insert from my old wallet, but it kept falling out. The old one had one more slot. ConsOne more slot would be nice. Works well with wallet, however, will add up to an extra 3/8 inch to the thickness. A little too much for my comfort. ProsIf you need extra sleeves, this is the ticket. I received the photo insert and feel another insert or two would be better than the standard 5 - I have purchased other inserts that conatin 6. Also, the material of all inserts I've purchased, crack or tear in short order, thus I feel a stronger material would be welcome even at a higher price. Inserts are great and a very reasonable price. Deliverly was quick ! Very happy with product! Love these wallets. Purchased one for my son a couple years back and just had to buy two for my husband! Can't get better than these! Then turned around and purchase the photo insert so when he shows off his wallet, he can also show off his beautiful children! ConsJust wish the photo insert were included with the wallet! 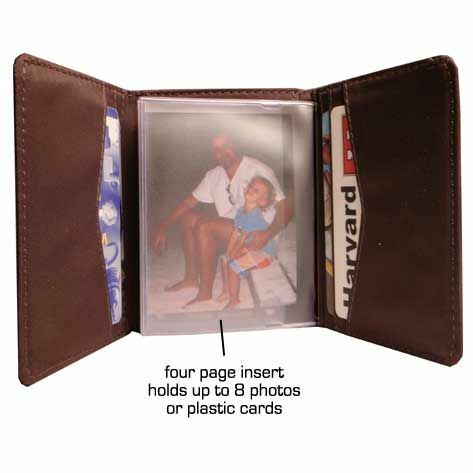 Tri-Fold Wallet Card insert allow for added room for photos in you Big Skinny wallet.